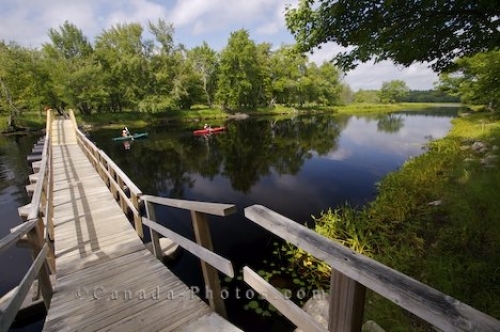 A footbridge crosses over the calm waters of the Mersey River in Nova Scotia, Canada as kayakers paddle underneath. This footbridge makes the perfect walkway for people choosing to cross the Mersey River in Kejimkujik National Park in Nova Scotia, Canada to explore the lush greenery on the other side. Kayakers paddle peacefully under the footbridge as they explore the areas of the Mersey River by water. Foot bridge and kayakers on the Mersey River in Kejimkujik National Park and National Historic Site of Canada, Kejimkujik Scenic Drive, Highway 8, Nova Scotia, Canada. Picture of kayakers on the Mersey River in Nova Scotia, with a footbridge above giving people easy access to cross the river.